In this Photoshop photo effects tutorial, we'll learn how to create interesting photo border effects using Photoshop's brushes. Photoshop ships with so many great brushes that the possibilities for different border effects are virtually endless, especially since we can combine multiple brush strokes and different brush tools, like the Eraser Tool, for even more variety! In this tutorial, we'll focus on the brushes that Photoshop installs for us, but if you know how to create your own custom brushes as well, then there really is no limit to what you can come up with. One of many possible photo border designs. Photoshop's Layers panel showing the image on the Background layer. Photoshop places the copy above the Background layer and names it "Layer 1". This brings up Photoshop's Canvas Size dialog box. I'm going to add half an inch of canvas space around my photo by entering a value of 0.5 inches for both the Width and Height options. Make sure your measurement type is set to inches and not pixels or some other type. Also, make sure the Relative option below the Width and Height options is checked. Add extra space around the photo with the Canvas Size dialog box. The extra canvas space has been added and filled with black. Step 3: Add A New Blank Layer Above "Layer 1"
Add a new blank layer by clicking on the New Layer icon in the Layers panel. Hold down Ctrl (Win) / Command (Mac) and click on the layer preview thumbnail for "Layer 1". A selection outline appears around the image. Switch between panels that are grouped together, like the Layers, Channels and Paths panels, by clicking on their name tabs. Click on the "Make Work Path From Selection" icon to convert the selection to a path. Paths in the Paths panel look very much like layers in the Layers panel. A thin line (the path) now appears around the photo in place of the selection outline. Photoshop paints with the Brush Tool using the current Foreground color, so before we go choosing a brush, let's set our Foreground color to white. We'll start off using white as our border color, but we'll see how to easily change the color at the end of the tutorial. The Brush Tool paints with the current Foreground color, which should now be white. Open and close the Brushes panel with the toggle icon in the Options Bar. This opens Photoshop's Brushes panel, where we can choose from any of the preset brushes that were installed with Photoshop. Make sure the Brush Presets option is selected at the very top of the left column so we can see a preview on the right of all the brushes that are available to us. To choose any of the brushes, simply click on its preview icon. If you have the Show Tool Tips option enabled in Photoshop's Preferences, you'll see the name of the brush appear as you hover your mouse cursor over each icon. Click on a brush to select it. A preview of the brush stroke will appear at the bottom of the Brushes panel. Let's see how this brush looks as a photo border. To hide the Brushes panel from view so you can see your document window more easily, click once again on the toggle icon in the Options Bar. Or, for a faster way to open and close the Brushes panel, press the F5 key on your keyboard. Click on the "Stroke Path With Brush" icon in the Paths panel. The result with the first brush. Trying again with a different brush. A different brush gives us a completely different result. If you find that the brush stroke is either too thick or too narrow, undo the brush stroke with Ctrl+Z (Win) / Command+Z (Mac), then change the size of the brush using the left and right bracket keys on your keyboard. Press the left bracket key ( [ ) repeatedly to make the brush smaller, or the right bracket key ( ] ) to make it larger, then click on the Stroke Path With Brush icon to try again. Remember, you'll need to click on the Work Path in the Paths panel first to make the path active before you can click on the icon. Click on the menu icon in the top right corner of the Brushes panel. Choose a different brush set from the list. Choose the Append option to add the new brushes in with the existing ones. The Heavy Smear Wax Crayon brush looks like it would make a good photo border. A third photo border created simply by choosing a different brush. There's lots of great brushes to be found in the additional brush sets, so be sure to load them all and try them out! One of the most interesting aspects of Photoshop's brushes is that they work with any brush tool, not just the official Brush Tool. For example, you may not think of the Eraser Tool as a brush, but it is, and all of the brushes we've been using with the Brush Tool can be used with the Eraser Tool. The only difference is that instead of painting a new brush stroke, the Eraser Tool can be used to erase part of an existing stroke, adding even more creative potential to your photo borders! All of Photoshop's brushes can be used with any brush tool, including the Eraser Tool. Stroking the path with the Eraser Tool erased part of the existing border along the path. You can spend a lot of time playing around and experimenting with the various brushes, the Brush Tool and the Eraser Tool, and I highly encourage you to do so since there's no limit to the photo borders you can create. To finish things up, let's see how to change the color of our photo border. We'll do that next! Step 15: Add A Color Overlay Layer Style To "Layer 2"
Switch back to the Layers panel, click on the Layer Styles icon and choose Color Overlay. Click on the Color Swatch to change the photo border color. 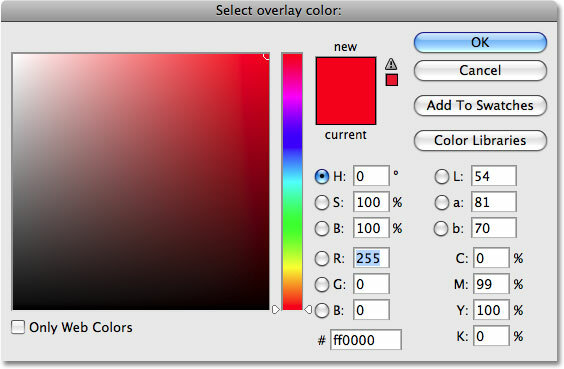 Photoshop's Color Picker dialog box. Click on a color in the photo to sample it and use it as your border color. The final photo border effect. And there we have it! 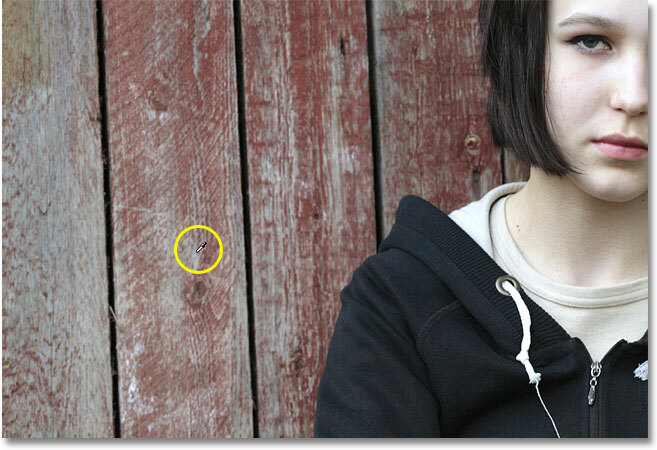 That's how to create interesting photo border effects with brushes in Photoshop! Visit our Photo Effects section for more Photoshop effects tutorials!